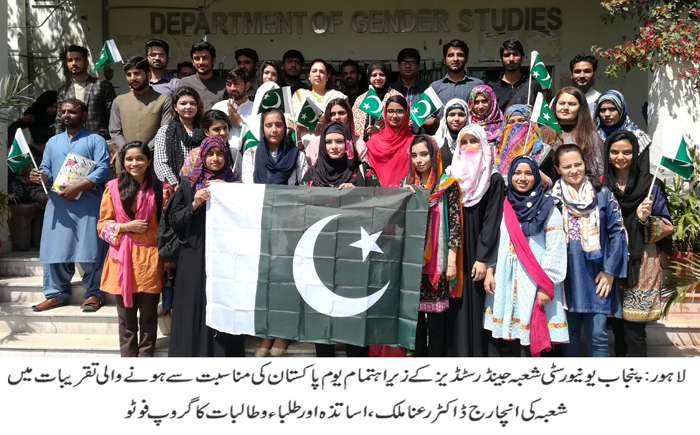 LAHORE: (Friday, March 22, 2019): Punjab University Department of Gender Studies has organized seminar and various activities in connection with Pakistan Day. Incharge Dr Raana Malik, faculty members including Saba Lodhi, Nudrat Kamal, Nazia Abdul Ghaffar and a large number of students participated in the event. The faculty members shared their thoughts to commemorate the ideology of Quaid-e-Azam Muhammad Ali Jinnah and Allama Iqbal. Students also presented patriotic poetry, national songs and participated in quiz competition.